HOUSTON – A Harris County jury has awarded $11.4 million to Houston technology company Function One Consulting Group L.L.C. after a competitor made false accusations of tax violations to Function One’s then-largest customer. The jury’s verdict includes $1 million in punitive damages based on the conduct of Function One competitor Accudata Systems Inc., which also included making false reports to the IRS, FBI, and Texas Workforce Commission. Accudata’s false allegations were sent to customers as well as state and federal investigators. “This was a spiteful war by a competing company that spread lies to customers and state and federal agencies hoping to stir up trouble. The jury saw that it cost our clients a good customer when they lost a contract because of these falsehoods,” says Steven Mitby, lead trial counsel for Function One and a partner in the Houston litigation boutique Ahmad, Zavitsanos, Anaipakos, Alavi & Mensing P.C., or AZA. Mr. Mitby tried the case with AZA associate Adam Milasincic. The false allegations began after Function One hired several employees who previously worked at Accudata. Function One filed suit, and Accudata responded with a counterclaim for mental anguish based on Function One’s use of a private investigator and Function One’s owner parking his Lamborghini sports car in front of Accudata’s offices. That claim was tossed in a directed verdict by Harris County State District Judge Michael Landrum. Jurors also were shown extensive emails sent to Accudata employees defaming Function One. The jury also saw a letter from the Texas Workforce Commission saying there was no problem with Function One’s employee classification. None of the other agencies ever took any action on Accudata’s false allegations. Stories about the case are available for subscribers of Texas Lawbook (AZA Prevails in $11 Million Jury Verdict) and of Law360 (Tech Co. Wins $11.4M For False Claims It Dodged Payroll Tax). Coverage by CRN for the tech industry can be found here (Jury Awards Function One $11.4 Million In Lawsuit With Accudata Systems). The case is Function One Consulting Group L.L.C. v. Accudata Systems Inc., et al., No. 2009-79590, in Harris County’s 113th Civil District Court. Ahmad, Zavitsanos, Anaipakos, Alavi & Mensing P.C., or AZA, is a Houston-based law firm that is home to true courtroom lawyers with a formidable track record in complex commercial litigation, including energy, intellectual property, securities fraud, construction and business dispute cases. AZA is recognized by Chambers USA 2014 as among the best in Texas commercial law and by U.S. News & World Report and The Best Lawyers in America as one of the country’s best commercial litigation firms in the 2014 listing of the nation’s leading law firms. National corporate counsel named AZA one of the country’s best in client service among law firms serving the Fortune 1000. 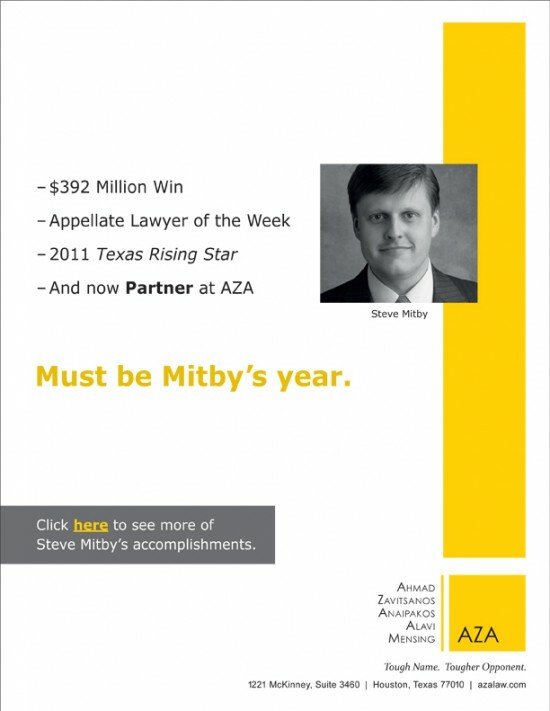 AZA has been hired on many occasions by the same companies the firm has prevailed against at trial. Read more at https://www.azalaw.com.